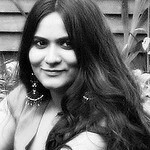 After long unexpected break from blogging, it feels strange to sit here and share few titbits of my life and a recipe. Although my mind is all jumbled up with hundreds of things happening around me, my heart and my fingers seems to know their business. As the words pour out from my heart and dances on my fingertips tapping furiously on the keyboard, first thing I want to say to you is a big thank you! 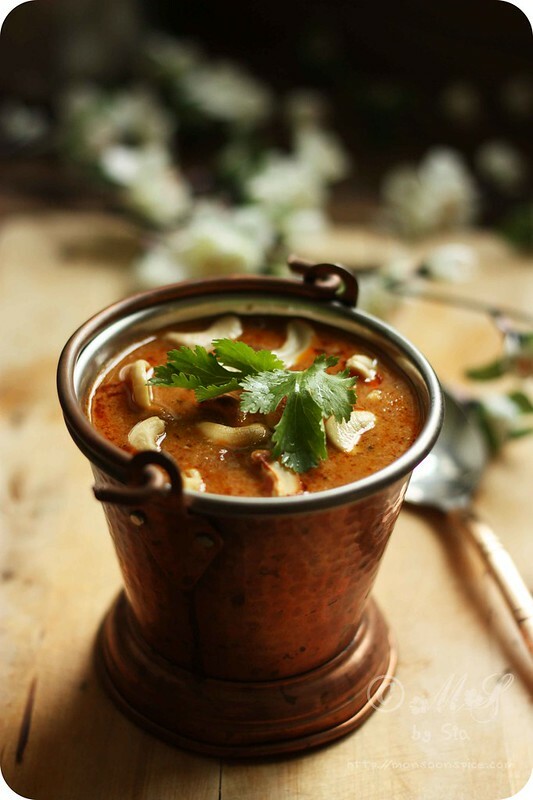 Today I have this regal dish of Kaju Masala or Cashew Curry for you. It is my mother’s signature dish which she cooks for her very special friends and family (which actually includes everyone in her friends and family list ;) whenever they visit our home. 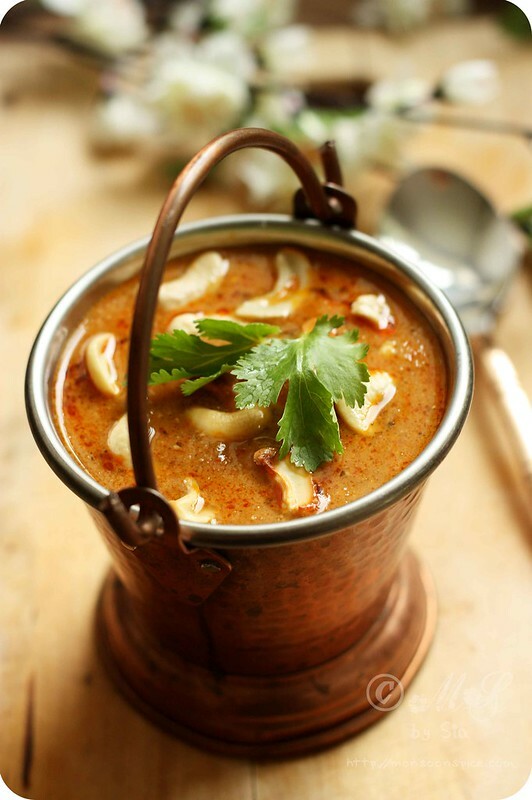 The sweet cashew nuts are lightly roasted in little ghee till they turn light golden shade of beauties and then simmered in velvety creamy gravy of onion, tomato and very special aromatic spice blend. From the moment the onion paste is fried in pure Desi ghee, the whole house would start to smell like a piece of heaven. And by the time the golden cashew nuts are added to the gravy and simmered, the house transformed in to a divine temple of goddess Annapurna (Hindu goddess of nourishment)! 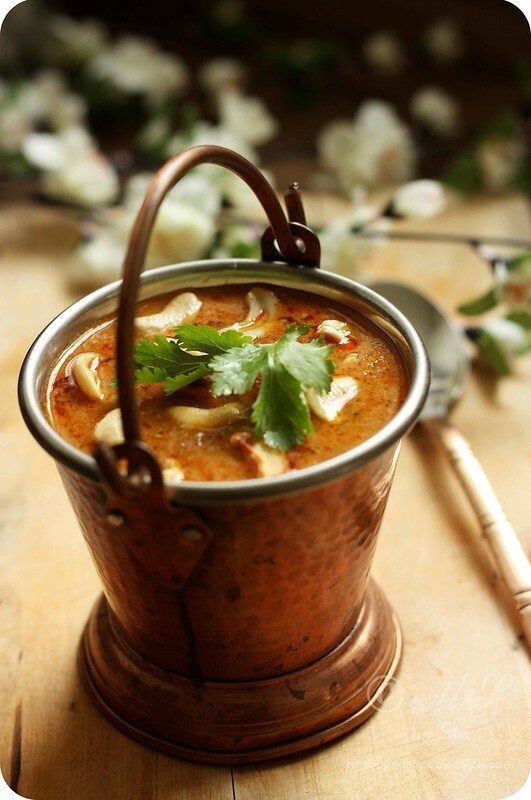 The recipe for Kaju Masala or Cashew Curry is quite simple and straightforward and is actually fuss free. This Kaju Masala or Cashew Curry has become Lil Dumpling’s favourite curry and I make it mildly spiced to suit his taste buds. So adjust the seasoning and spices according to your taste buds. 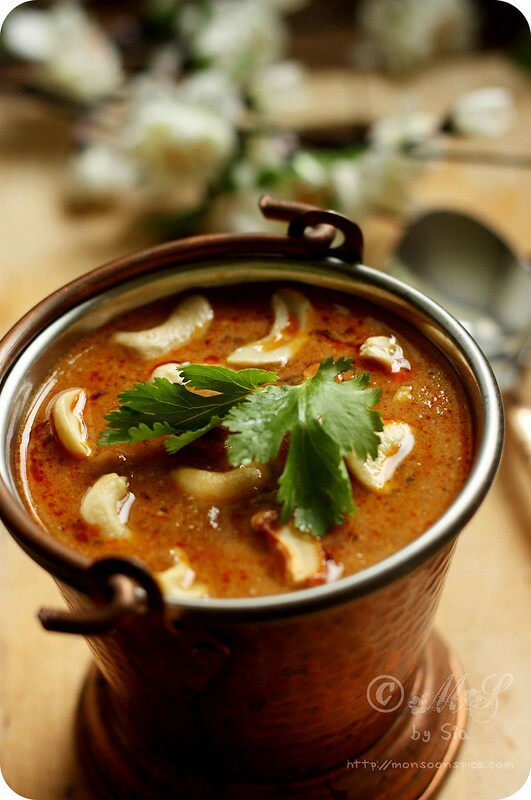 You can also add almonds to this gravy (soaked in water over night and skin removed) or replace cashew nuts with Paneer (Indian cottage cheese) for different flavours and textures. The possibilities with this basic gravy are endless. So do me a favour and go and treat yourself and your loved ones to this velvety goodness of Kaju Masala or Cashew Curry! 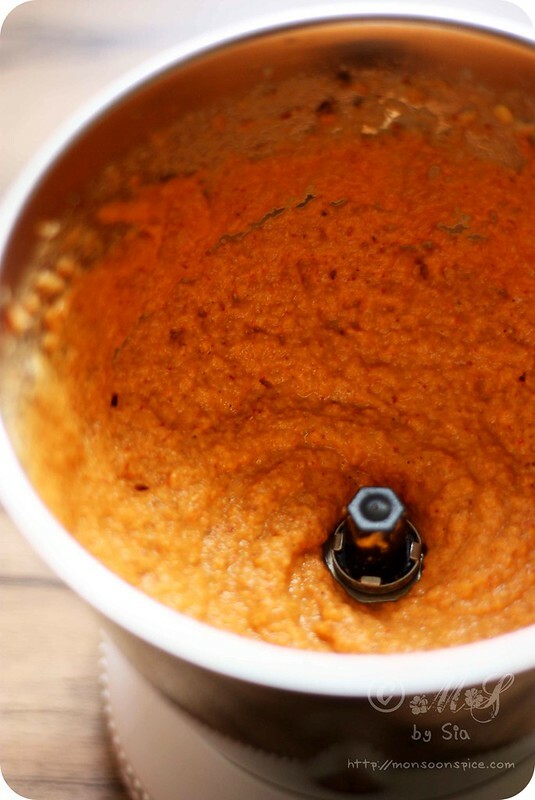 Grind all the ingredients listed under onion paste to smooth paste without adding any water. Keep it aside. Heat about 1 tbsp of oil or ghee and add cashew nuts. Roast these nuts on medium to low heat till they change colour to golden. Remove from pan and keep it aside. In a same pan add about 1½ to 2 tbsp of oil or ghee and add ground onion paste. Cook it on medium flame, stirring continuously, till its raw smell disappears and the oil starts to leave the sides, about 7-10 mins. This is a crucial step and be patient as the undercooked onion paste will turn the curry to taste bitter! Mix in crushed kasuri methi and ginger-garlic paste and stir it for another 2-3 mins. Add all the spices (garam masala, kitchen king masala and amchur powder) and give it a good stir, about 1 minute. Next, mix in tomato puree and cook it for 3-4 minutes. Mix in salt to taste, a tsp of sugar if needed, and about 1½ -2 cups of water and bring the curry to gentle boil, about 5-7 minutes. Add fried cashew nuts, and fresh cream if using, and adjust the seasonings. Let it simmer for another 5 minutes for all the flavours to blend well. Switch off the pan and garnish with chopped coriander leaves. Serve this Kaju Masala or Cashew Curry with any Indian flat breads (Whole Wheat Naan or Butter Naan or with any stuffed parathas) or plain/flavoured Basmati rice and enjoy this rich, creamy delight! Ghee, Indian clarified butter, works best in this recipe instead of oil. But if you are a vegan or health conscious, please feel free to use oil instead. Addition of fresh cream is optional. I have used it to mellow the spices as Lil dumpling loves to eat what we eat these days! You can also add almonds to this Kaju Masala or replace cashews nuts with Paneer (Indian cottage cheese) for Paneer Masala. So Nice shots.. and nicely presented.. Fantastic! 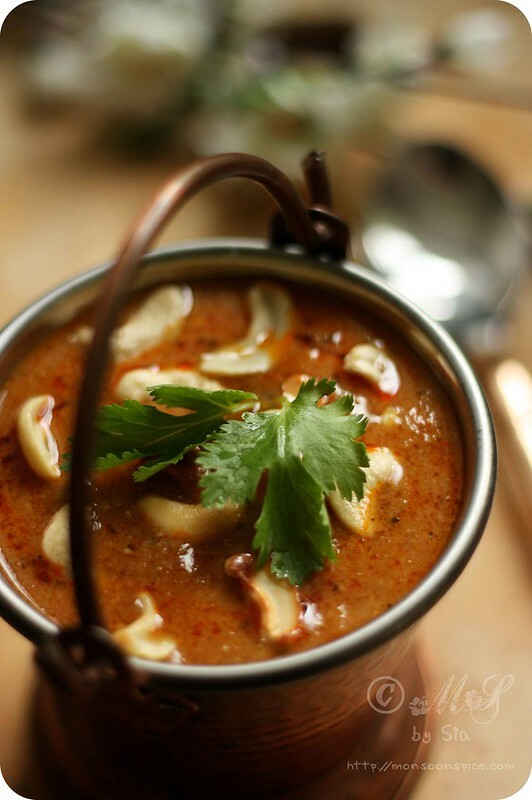 I love cashews and curries, so that dish is definitely for me. thats a wonderful kaju masala, sia. i am so hungry looking at the pics. i have bookmarked this recipe which i will make when my blender starts working. 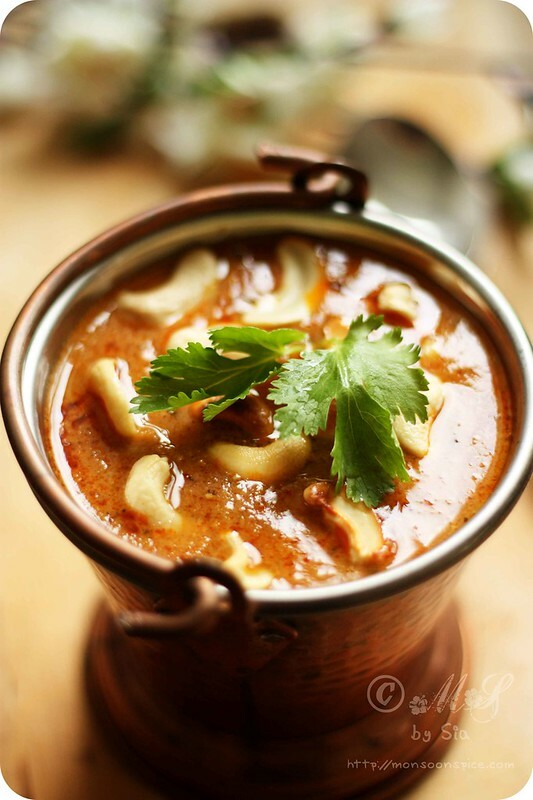 yum yummy delicious and lip smacking cashew nuts masala. Oh that is a rich curry.. 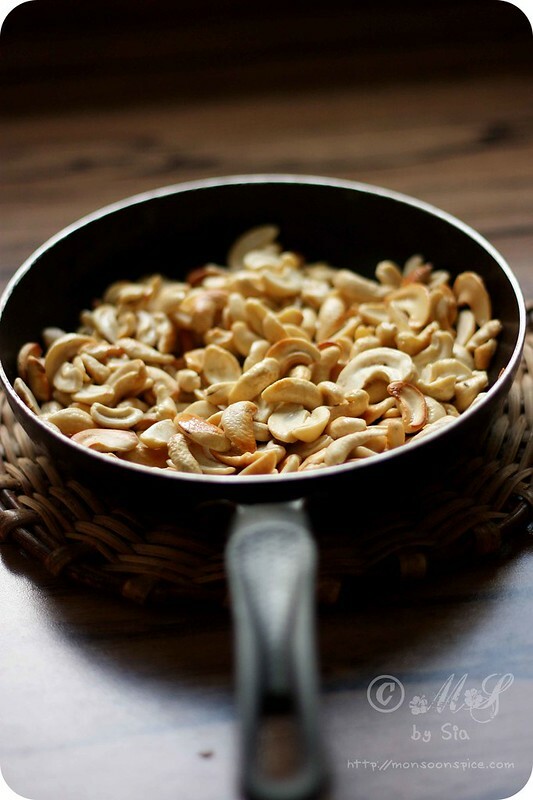 I love cashew nuts.. Would really want to make it for some special occasions..
congrats sia- well deserved and hey the masala looks inviting in that dainty lil bucket ! Looks delicious..we used to have kaju curry in a particular restaurant back inindia..am reminded of that...will make this soon..
Oh Sia... these pictures left me drooling. This looks so very good. Each click is so uniquely shot which of course takes the recipe to a different level.A very innovative recipe too.. Always feel happy when I visit here :)...and even happier when I cook your recipes which always come out perfect! 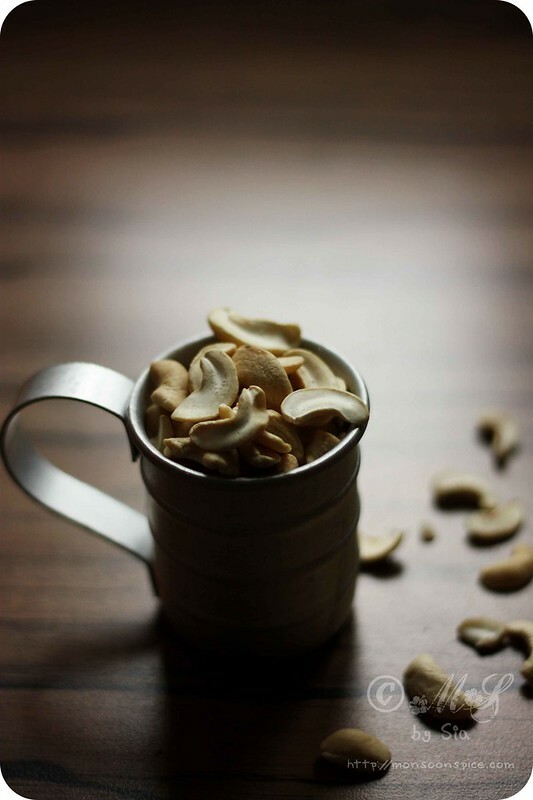 Creamy gravy and crispy cashews sounds like a delicious combo.Love the pics,how did you make the handle stay upright:)? Hey, I also make Kaju curry almost same way. Yours look very very creamy and smooth gravy. 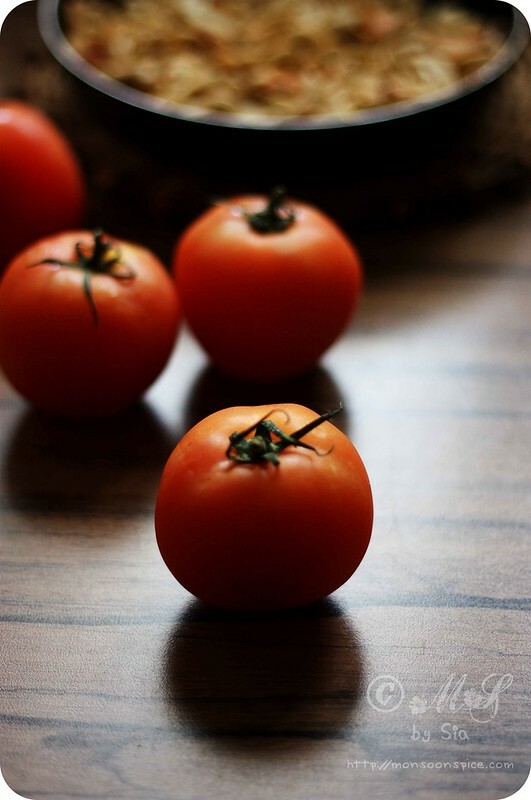 Lovely recipes on your site. First, I’d like to congratulate you on your award – that is quite an achievement! It is clear how passionate you are about both family and food. I truly respect your creativity in the kitchen and your ability to make your dishes kid-friendly! 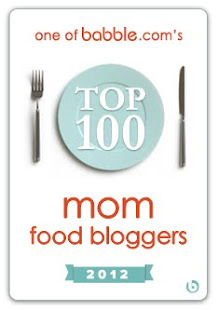 It’s an even more admirable feat because all of your dishes are vegetarian or vegan! That’s why I work with the Meatless Monday campaign. We recently launched a new campaign, The Kids Cook Monday, which is a movement to encourage families to cook and eat together every Monday. When kids pitch in making meals, they’re empowered to consider the portions, vitamins, and nutrients in their food, spend quality time with their family, and develop important life skills such as math and following instructions. Because of your blog’s focus on providing tasty and nutritious meals for your child, I was hoping that you would be interested in helping to promote this campaign! (http://www.TheKidsCookMonday.org). This video by Dietitian Julieanna Hever is interesting to watch, as she explains the benefits of cooking with kids while she cooks with her daughter: http://www.youtube.com/watch?v=v8CCD1FWRrg. We are looking for bloggers to help us spread the word about this new campaign with weekly Kids Cook Monday posts, which may provide a family recipe, describe a family dinner, or present family cooking video. If you’re interested in writing weekly Kids Cook Monday posts on Monsoon Spice, please email me back at blogs@mondaycampaigns.org. love the color! an the creamy curry. congratulations on the feature! I made Kaju curry based on your recipe today. Turned out very well. Thank you! for my lovely twins daughters. Can I add in fried chew? @chhaya bhoite, sure you can. here I have added ghee roasted cashews are added to the gravy which is quite same as the fried cashew nuts. We tried it today. My wife loved it!!!! Thank you for such wonderful recipe. I like so much.Very tasty and spicy. Thank u so much. An Update and A Thank You!